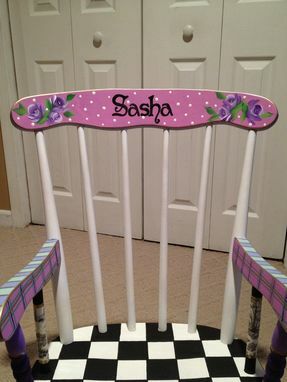 This childs rocking chair was requested in purples, lavenders and greens. 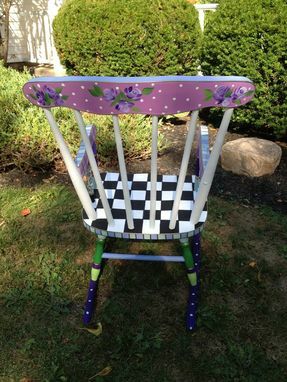 The customer liked the pattern of the "Zoe" design I have listed, but requested color modifications. She also wanted a table to match. Ta Da!!! What a lucky little girl Sasha is!! 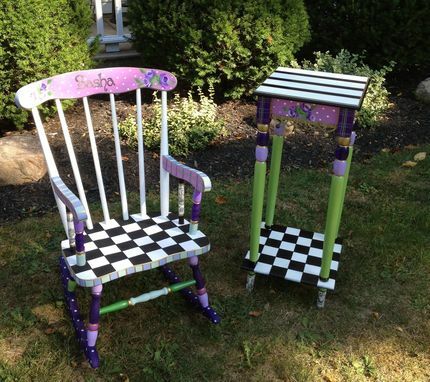 Do you have someone in your life that would love a hand painted - PERSONALIZED - rocking chair? Perfect for reading, having tea parties with friends or just relaxing. This is a very special piece of functional art. Roses, plaid, stripes, polka dot, toile accents.......a perfect, whimsical combination. I use Whitewoods unfinished Boston Rocker, or Woodcraft Spindle Rocker. 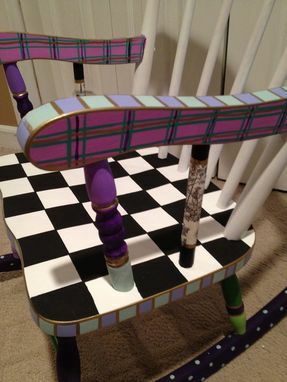 This particular chair, can be painted to suit. Just let me know if you want it to look like this, or if you prefer different colors or designs.